I went to NISHIJIN TEXTILE INDUSTRIUL ASSOCIATION on the other day. Nishijin is the way of weaving textile. It has a very long history and 20 processes to complete. 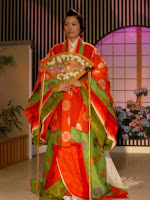 The textile is originally used for Kimono, Obi (sash) or tie, handkerchief these days. 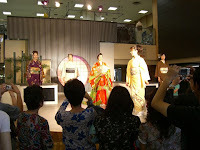 Why don't you visit this place if you are interested in Kimono or design for clothes ? You will see a girl in the Heian era (A.D. 1000) clothes.